Excursion Last Tuesday  Lively Sale of Town Lots  Cotton  Shepard and Jones. A little after 8-o'clock last Tuesday morning, the train for the new town of Ellinger, the depot on the Columbus and LaGrange tap, pulled out from the depot at this place, freighted with a jolly crowd on board, who had determined to combine business and pleasure, for one day at least. From this point the following persons were on the train: Maj. Jas. Converse, Superintendent of the "Sunset Line;" Capt. E. G. Thompson, Master of Transportation; T. U. Lubbock, auctioneer of Houston; H. A. Washburn; Conductor; J. F. Lucas, Civil Engineer; and Geo. W. Breeding, Agent; Maj. R. L. Oakes, Sheriff J. A. Toliver, Geo H. Allen, E. J. Sandmeyer, Esq., I. W. Middlebrook, Friench Simpson, Esq, District Clerk J. H. Johnson; W. L. Adkins, W. A. Engelhardt, Jose Cassagne, C. Hahn, R. Goldsmith, Mr. Hill and family, Chas. Creary and family, Geo B. Crawford, and Misses Wickware and Gourley. From Buescher's store, Messrs. J. H. Whitehead, Dock Anderson, Henry Buescher and Walter Greer. From Weimar, Messrs. W. B. & Stephen McCormick; Col. E. H. Fordtran, of Flatonia. We understand there were $1680 worth of lots sold after the sale was over which maks total amount $18,000. The tract of land on which the new town is laid off cost the railroad company $2900. Something over 100 lots sold. At the new town, two or three framed buildings are on the grounds, waiting to be put up as soon as parties could purchase lots. About 250 bales of cotton have already been shipped from Ellinger. Now that lots have been secured, we expect building to go on lively. On the train the vote was taken for our Congressional nominees, and resulted as follows: For Shepard, 35; for Wash Jones, 3. A dinner prepared for the occasion waas discussed with evident relish by all present, free of charge. The party returned in the evening in good health and spirits, having enjoyed the excursion vastly. Ehlinger, the R. R. station on the La Grange Branch, presents the appearance of a live business town, and with the country surrounding it, promises in the near future to be a place of considerable importance. This town was laid off and the sale of lots commenced on the twenty sixth of October last, since which time lots to the amount of over $20,000 have been sold. It requires live, active men to build up a town, and we will venture to say that no town in the state of its size can boasst of a more active set of business men than ehlinger. There are now three houses here doing a general merchandis business, viz: Hotmann & Co., Shaver Bros., and Jos. Kreneck, and all have as much as they can do to supply the trade. Hotmann & Co. are also doing a general receiving and forwarding business, and those having anything to do in this line, would do well to do in this line, would do well to call on them. See their card in another column. Ehlinger has also three lumber yards to supply the town and surrounding country, viz: L. G. Bachelder, Messrs. Wilkins & Nare and Messrs. Hall & McCormick. Mr. Bachelder is also dealing in builder's hardware, and buys and pays the highest market prices for cotton seed, hones, &c. Parties going to Ehlinger to buy lumber should give him a call. See his advertisement in this issue. In addition to these business houses there are three saloons, one barber shop, one physician and drug store and two hotels, Mr. John W. Hill will soon open a family grocery with a full and ocmplete stock of grocerieis. In the person of Mr. W. J. Storms Ehlinger has one of the most polite affable and accomodating R. R. agents of any town in the stae, and while we do not want to rob Ehlinger of her agent, we trust that the R. R.authorities will see proper to transfer Mr. Storms to La Grange. It is a pleasure to do business with such a man, and the change would be entirely acceptable and satisfactory to the citizens and business men of La Grange. If Ehlinger continues to improve in the future as it has in the past, it will not be long before it will be one of the best R. R. stations in the State. It has some of the best portions of Fayette and Colorado couties to support it, and gets a good trade from the Colorado valley. The company in laying off the town reserved some very desirable lots for church and school purposes, and we understand that the citizens of the town contemplate putting up a suitable buildingon them for those purposes. Over 2000 bales of cotton have been shipped from here since it became a town. Last Monday we visited Ellenger [sic. ], going down on the morning and returning on the evening train. We were about five hours in the town and made the acquaintance of nearly all the business men. They received us very kindly indeed, for which we return our thanks. We found that Ellenger has three lumber yards, four general merchandise and two grocery stores, one drug store, one furniture store, four saloons, three hotels in operation and one building , a livery stable, saddlery shop, one bucher, one wheelright, steam and grist mill, two painters, one carpenter, and lastly a most clever and polite gentleman, in the person of Mr. B. W. Russell Railroad Agent.La Grange Journal. Do you have old photographs of Ellinger you would like to share? Ellinger is situated on the branch road of the Southern Pacific Railroad from Columbus to La Grange about twelve miles southeast from La Grange. It is located on the W. O. Burnham league; one hundred acres of its present site belonged to John H. Meyer and one hundred to Henry Fordtran of Galveston. The name of Ellinger was given to the place by a Bohemian named Andreas Ondrey, who suggested the name to James Converse, superintendent of the Southern Pacific Railroad, while in conversation with him. It was laid out in 1883 and the first men who opened up business in Ellinger were Fritz Hotmann, Charles and Dan Meyer, Chas. v. Rosenberg and Hill & Hill. North of Ellinger lies the rich black land Ross prairie, south of it the productive bottom lands of the Colorado River. These rich, fertile lands are separated from each other by a sand and gravel ridge covered with postoak. Therefore the surrounding country of Ellinger, with the exception of said gravel ridge, is a rich agricultural section. Ellinger has two churchesa Lutheran, with Rev. Robert Heise, who also preaches in Fayetteville and Haw Creek, and a Catholic, situated about one mile north of Ellinger at a place called Live Oak Hill. The Catholic Church is under the care of Rev. Father Chlapic. The school of Ellinger is under the able management of Prof. Dippel, a conscientious and faithful teacher. Ellinger has four lodges: The Sons of Hermann, C. F. Steves, president, A. F. Weber, secretary; Woodmen of the World, E. J. Weber, presiding officer, A. F. Weber, secretary; Odd Fellows, and C.S.P.S., a Bohemian lodge. A large public hall serves as meeting place for public gatherings and for festive occasions. Before the building of the Missouri, Kansas & Texas Railroad to Fayetteville the business of Ellinger was considerably larger. This road, running at a distance of about four miles from Ellinger, has cut off a large part of its trade. Still, as it lies in a rich agricultural section, which, year by year, becomes more developed, it maintains the volume of its old trade and does as much business now as ever, though the scope of country which was tributary to Ellinger has been somewhat reduced. 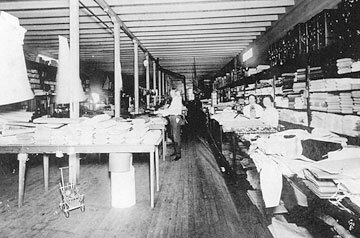 Ellinger consists of four general merchandise stores, three groceries, two furniture houses, three hardware stores, one implement and carriage house, one drugstore, two gins, two blacksmith shops and four saloons. The writer is obliged to the following gentlemen who took some interest in his work on their home county for their patronage and hopes that the bestowal of their confidence may have been placed on a worthy enterprise and that his work may meet their approval. The oldest business men in Ellinger are Messrs. J. and B. Wacker, who established themselves in business at Ellinger in 1884. They carry a large stock of staple and fancy groceries, hardware and crockery, and especially a fine assortment of pistols, guns and ammunition. They are reliable gentlemen and substantial, solid business men. 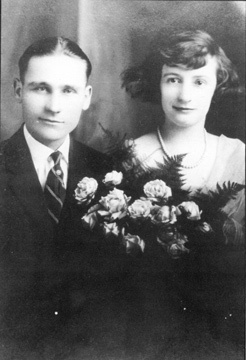 Their father, Mr. Dietrich Wacker, was one of the first settlers in Ross prairie. C. F. Steves has a lumber and hardware business of the most extensive assortment, carrying everything from a nail to a stump-pulling machine. A customer can get there articles which he often would fail to get in large size cities. E.J. Weber keeps in his elegant drugstore pure and fresh drugs and other lines of goods that are usually kept in a first-class drugstore. He also serves the public as notary public and sets up all legal documents in binding shape and style. W. F. Burow owns a first-class gin and turns out a superior class of cotton. He constantly studies how to improve his machinery, and on account of his close attention to business has become a model ginner in the county. J. Y. Machalek is a popular young merchant in the furniture and hardware business at Ellinger, and a skillful mechanic. Scheel Brothers are the proprietors of a first class barroom, which has become the headquarters for the farmers of Ellinger. In Live Oak Hill, one mile north of Ellinger, Mr. Aug. Girndt welcomes in his elegant saloon his guests from near and far, keeps the purest whiskies and other liquors. He is the proprietor of a fine hall with one of the best floors for dancing that can be found in the county. Young and old gather there for amusement and recreation. The population of Ellinger is German and Bohemian. Among the first and oldest settlers of the Ellinger neighborhood may be mentioned Dietrich Wacker, Dan Meyer, John Meyer, Aug. Beyer, Joseph Raabe, Chas. Ehlinger, Sarrazin, Dohm, Jacob Dirr, Peter Koehl, Joe Koehl, Jacob Koehl, Andreas Schreiner, Muegge, Henry Cook, Jos. Sommers, Wm. Hoelscher, Anton Holster, Fietsam, Hy Fattmann. 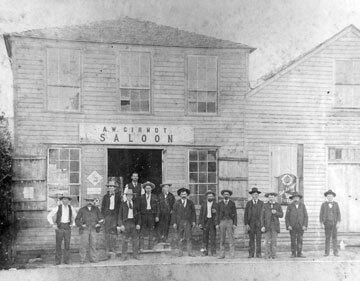 Click on saloon photo for enlarged view. It was our pleasure to pay the little town of Ellinger a brief visit last Saturday, leaving here on the morning train and returning late in the afternoon. The merchants and business men generally seemed to be in good humor, having enjoyed a very busy fall, the effects of which are still pleasant. In speaking to some of the merchants, we learned that the farmers were actively engaged in getting their land in excellent condition for planting, and in some instances the farmers, on account of the exceptionally warm weather, were planting corn during last week, and would continue to do so this week, claiming that the warm weather would soon render the ground hard and planting an un- [……] the grass was green and of very prolific growth, fine cattle and horses seemed to be in their glory, and the owners figured upon the handsome profits soon to be realized upon their sale. Some changes had been made since our last visit, still we managed to get about without inconvenience. Charley Ehlinger’s handsome new concrete store, a credit to any city, stares the visitor in the face immediately upon arriving. It is a very commodious structure, and the owner, one of the pioneer merchants of that section, carries a very large stock of general merchandise. A very interesting character, one who has followed the destinies of Ellinger for years, is Henry Buescher, the old German furniture dealer. Forty or more years ago, he learned the furniture trade in the old country, and when the county was still young he was engaged in renovating furniture and selling small stocks of the household necessities. A half hour’s talk with the gentleman, during which time some interesting stories of old Ellinger were graphically told, was time pleasantly spent. Mr. Buescher, however, claims that the present days are so different from those of olden times, and business, such as he enjoyed in the sixties, is now only memory. A. J. Schell [Scheel], the “happy hour” man, who dispenses the best Kentucky and Milwaukee, as well as Texas products; Theodore Beyer, Charley Girndt, and C. W. Meyer, the latter in charge of the Ellinger gin, with his two valuable assistants, gave us the glad hand, and helped us kill an hour without trouble. Koehl & Prasifka, located on the upper end of the city, two hustling young people engaged in general merchandising, were interesting a number of farmer friends in modern merchandise and enjoying a good trade. 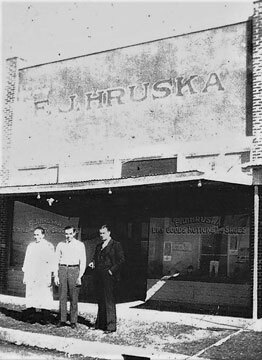 The boys were somewhat worried, however, as they were anxious to remove to the Hruska old stand, but were prevented from doing so on account of failure to locate the owner of the building. Their present location is somewhat small, preventing a suitable display of their new spring goods. Handsome fixtures just received were yet unpacked on account of the contemplated removal. Louis Vogelsang and the balance of the bunch helped to entertain the visitor, and the friendly business relations long since established were maintained. About the only man we found a trifle out of sorts was Dr. A. P. Knolle, and this little aggravation was due to a balky gasoline engine. An amusing story was told to us before leaving. Charley Ehlinger had received a registered Poland China male, about three months old, had placed it in a convenient pen at his home, but upon the day following the grunter was gone. Every pig pen in the neighborhood was searched, but at last Charley gave it up. As we entered his store, George Cook announced that he had a fine boar pig at his house, a stray porker that had come a night or two before, and wanted to know if it was not Charley’s. Mutual friendship followed in apple pie order, and Charley sent out to Mr. Cook’s for his fifteen dollar pig. Ellinger began as a settlement at Live Oak Hill (also called Hostyn Hill) east of the present site, between La Grange and Columbus. The town was moved to the modern location to be on the new railroad. The town was named for Joseph Ehlinger, a native of France and a veteran of Napolean's army during the Russian campaign. Ehlinger, came to Texas in June of 1835 and served in the Texas Army at San Jacinto. For his service, he was granted 640 acres, which he chose to be located in present day Fayette and Colorado counties. This extensive acreage included the present site of Ellinger, which prompted Andrea Ondrej, a Czech who immigrated to Texas in 1869, to suggest the town be named in memory of Ehlinger, who drowned crossing Buffalo Bayou. The town was laid out in 1883 on 100 acres given by John Meyer and Henry Fortran. Fortran was a surveyor, whose family had extensive land holdings. The first Ellinger Post Office was established in October of 1877. It was located in a red brick building on FM 2503 near the downtown area of Ellinger. It was advanced to3rd class status from 1945 to 1949 and again in 1956-57. In 1965, the Post Office was moved to a building owned by the Juren family at 706 FM 2503. Mrs. Juren kept a delightful row of roses blooming in front of the building during her lifetime and Mr. Juren gave haircuts. In 1966, the Jurens received President Lyndon B. Johnson's "Natural Beauty Program Citation of Merit" with a rating of superior for maintaining the grounds and exterior of the Postal unit "in such a manner as to reflect credit upon the community and the Post Office Department." Ellinger was the only 4th class office to receive this merit award in the Dallas Region with 2,200 Post Offices under its jurisdiction. In 1968, a "Continuation of Excellence" award was issued. The following is a list of US Postmasters of Ellinger: F. Hotmann, 1877; G. Wacker, 1882; C. von Rosenberg, 1883; B. Martin,1889; C. Ehlinger, 1891; A. Weber, 1894; E. Weber, 1896; T. Hruska, Jr. 1904; C. Meyer, Jr. 1907; C. Ehlinger, 1911; C. Meyer, Jr., 1940; D. Juren, 1941; W. Jurajda, 1974; K. Kay, 2000. Kathy Kay is the present postmistress and answers the phone with a smile in her voice. 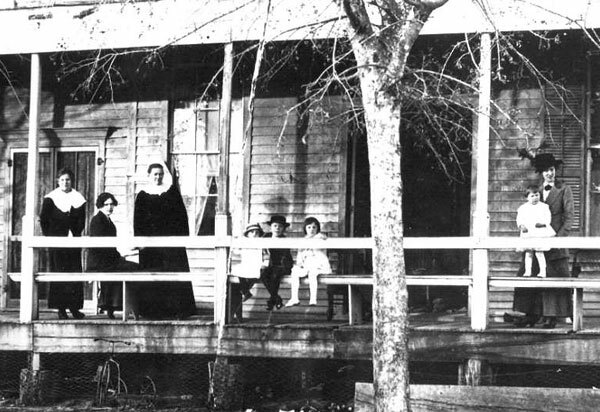 Mary Birkman Koehl and some of her family in front of The German Hotel, which she ran in Ellinger, c. 1915. It was located at the corner of W. Hollmann and FM 2503 where Walter Koehl later lived. “Tightest spot I’ve ever been in” - these words were used by an old Texas Ranger to describe an Indian fight he had been in during frontier times. These are also words that Fayette County Sheriff Will Loessin may have used a few times in his law enforcement career that spanned from 1895 to 1946. Some of his most dangerous situations took place in Ellinger. 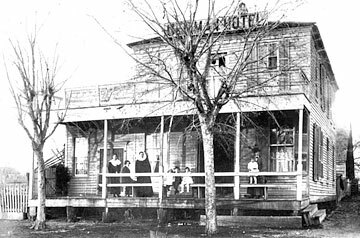 The towns of Ellinger, Plum, Winchester and Carmine were frequently the victims of criminal activity, because they were quite a distance from the Sheriff’s office in La Grange, did not have full-time City Marshalls, and were served by railroad lines that brought in various vagabonds. The following paraphrased account was told by Sheriff Loessin to Ben F. Harigel, editor of the La Grange Journal: At 12:30 on the night of Thursday, May 23, 1946, Mr. Loessin’s telephone rang. On the phone was Mrs. Frank Hruska of Ellinger, telling him that the store’s burglar alarm had gone off. Mr. Will, as he was called, picked up his chief deputy, Bob Koenig, and made a mad dash for Ellinger. Upon arriving, the officers drove down present-day Grover Street, stopping at the corner of Grover and Main Streets at the location of the old Meyer Store, where the Sheriff got out of the car. The Meyer Store, previously known as the C. W. Ehlinger Store, had also been the scene of a very dangerous shootout for Sheriff Loessin in 1926, when the officers exchanged a fusillade of bullets inside the small store. Mr. Loessin was 54 years old at that time. On this particular night in 1946, the previous scene from 1926 may have replayed in the mind of the determined sheriff. As Deputy Koenig drove down Main Street, he turned their car into the alley that ran down the middle of this block. This alley allowed for delivery wagons and later trucks to serve these businesses. It was also a place where customers could park to enter these businesses. Deputy Koenig parked the car in this alley and trained the spotlight on the back of the old Hruska Store. The pair were linked to other burglaries in the area. Sheriff Loessin later stated that he forgot his flashlight and if he had carried it, he would have been a perfect target for Thornton’s pistol. “The Lord was with me once more,” the sheriff observed. It should be noted that Sheriff Loessin was 73 years old at this time, and that he had announced several months prior that he would not be seeking reelection for County Sheriff. He was working without the body armor commonly worn today by law enforcement, and in his style, he went to this dangerous situation himself with only one deputy. Today, all the major players in this situation are gone, including the old Hruska Store in downtown Ellinger. However, our brave law enforcement personnel are still waging a battle against the criminal element, and some of these may still be musing about the “tightest spot I’ve ever been in. Time takes its toll….sometimes things succumb to the ravages of time, but occasionally some things are saved and re-purposed. To witness an iconic structure being renovated instead of razed is heart-warming, especially when there is a personal connection to the place being saved. The old Texaco service station in Ellinger on Hwy. 71 S. that was owned by Edwin and Glenora Hoelscher was saved from the wrecking ball thanks to the vision of its new owners. Edwin Hoelscher was my mother’s first cousin, so I spent many hours at the station during my childhood. It was not just a service station, but a gathering place - an early version of a convenience store combined with a beer joint and feed store. After leaving his family farm, Edwin Hoelscher, a native of Ellinger, first worked for Willie Jacob at his Texaco Station and small grocery store located on Hwy 77 S. next to the Faison home in La Grange. He married Glenora Koehl in 1941 and then served in the army during WWII. Upon his discharge from the army, Edwin worked at the Schobel Texaco Station in Ellinger for four months before buying it in April, 1946. The building was constructed in 1925 by Walter Koehl, who had a business there for two years. Then Clement Schobel of Columbus leased the building and had his brother, Robert, operate his Texaco Station until Edwin purchased it. Hoelscher’s Service Station soon became the hangout for locals. Customers could not only purchase gasoline and get their tires repaired, they could also take a break at the bar inside and enjoy cold drinks and a variety of snacks from jerky to ice cream. In addition, there was a small assortment of food, personal hygiene and household products. Animal feed was also available. Years ago, the Hoelschers even bought and “candled” eggs brought in by the local residents. Customers sat on swivel bar stools or gathered around a couple of old tables, one of which was frequently used for domino games. Edwin’s father was one of the regular domino players. The wooden floor was well-worn by the footsteps of generations of customers, many from the same families. Antique fixtures added to the uniqueness of the place. There was a 1941 GE refrigerator with a round motor on top that probably still worked until the doors of the station closed for the last time. Roll paper that was cut with an old-fashion paper cutter was used to wrap certain items of food like pieces of “rat” cheese that were cut with a large cheese cutter and then weighed on an old white porcelain scale. Beer signs, old calendars, photographs, dance hall placards and athletic trophies won by their grandchildren covered the walls. There was nothing fancy about the place – just another “Mom and Pop” establishment that was typical in rural America before franchised businesses and the migration from country to city forced most of them to close their doors. Many locals have fond memories of the old station. One person recalls that in the early 1970s, he and his brother and two other Ellinger boys referred to the station as “Hayhauler’s Haven”, because it was their destination after a hot afternoon of hauling hay. They would get a pint of ice cream and pour a large RC Cola on it – a great way to cool down. Twenty years later, Mrs. Hoelscher still remembered their coming in during hay hauling season and how she looked for them every afternoon. Edwin Hoelscher’s younger brother, Clemence, worked with him from 1948 to 1987, and his wife, two sons, Jimmy and Gary, and daughter-in-law, Nancy, helped as well. The business basically remained a “family affair”. Edwin had a fantastic memory about local history – he was like a book, considering what he could recall. He also was very involved in the community; especially the Ellinger Chamber of Commerce and was always available for anyone in need, whether it was to help with a disabled car or to round up someone’s stray cattle. In 1993, the Texaco Corporation wanted Edwin to modernize his station, which was not something he was inclined to do. So the Texaco star sign came down, but the station continued to operate with another gasoline product. Sadly, all things come to an end. Due to their advancing age and health issues, the Hoelschers were forced to close their service station in 2002. Edwin passed away in 2006 and Glenora in 2007, taking a part of Ellinger’s history with them. The old iconic building forlornly sat empty for years. A new owner removed the interior fixtures, but nothing more was done with the building itself. It was sold again and seemed to be destined for eventual collapse, destruction or removal. However, there was a silver lining to the cloud that hung over the old station. Thankfully, the current owners are now renovating the building to house a new business. A metamorphosis from old to new is a good thing. There is a certain charm and character that comes with the history of old places. If walls could talk, newcomers would get an earful! 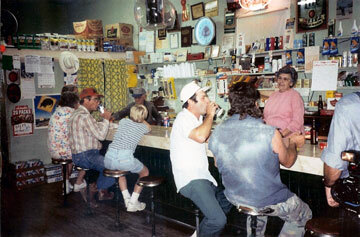 Photo Caption: Hoelscher’s Service Station, mid-1990s; Edwin & Glenora Hoelscher behind the bar. In front of the bar left to right: Laura, Lucille, Emil & E.J. koehl, Michael Svoboda; two persons on far right are unknown. Courtesy of Carolyn Heinsohn from the Hoelscher Photograph Collection. German Hotel and Koehl & Prasifka store photos contributed by Judy Koehl. Daniel and Ellen Juren contributed by Ruth Juren.